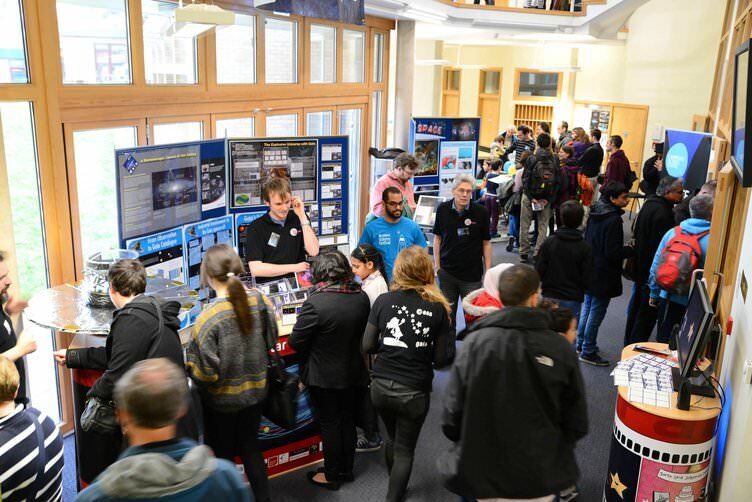 As part of the Cambridge Science Festival 2019, the Institute of Astronomy and the Kavli Institute for Cosmology will be open to the public on Saturday 23rd March, 2-6pm. There will be activities, demonstrations, and games suitible for all ages provided by the Institute of Astronomy, The Kavli Institute for Cosmology, and the Cambridge Astronomical Association. 2:30pm: Nimisha Kumari, "Cloudy with a chance of star formation"
3:15pm: Catrina Diener, "Galactic mega-cities: A short story on galaxy clusters"
4:45pm: Alessio Spurio Mancini, "Challenging Einstein with gravitational lensing"
In addition, Paul Fellows of the Cambridge Astronomical Association will present planetarium shows at 2:30pm, 3:15pm, 4pm, and 4:45pm. This event is free, and you don't need to book. Please note there is limited parking on site, which we will keep for disabled visitors only. Please park on the West Cambridge site and walk across to the Institute, or use the Madingley Road Park and Ride (10 minute walk). For more information, please look at the Cambridge Science Festival website, and if you still have queries please contact Matt Bothwell.